For my Foundations of US Government class, Mr. Donaldson asked us to create a presentation on a landmark Supreme Court case. He assigned me the 1824 Gibbons vs. Ogden case. I’d never even heard of this ruling before, but it was fascinating to learn what it was and how it impacts our lives today. 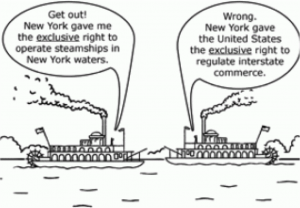 The case seemed insignificant in and of itself; two steamboat operators argued over who had the right to operate in some New York waters. One of the operators (Ogden) had a state license to operate, whereas the other operator (Gibbons) had a federal license. Ogden requested that Gibbons be restrained from operating in those waters. After New York ruled in Ogden’s favor, Gibbons appealed to the Supreme Court. They ruled in his favor, stating that the Constitution gave Congress the right to regulate commerce among the states. This was significant because it set the precedent that whenever federal law and state law conflict, federal law is supreme.